A quick note : the chart for 1 Across on Knitty is a JPEG, and rather difficult to read, as there are so many little squares! I've put my original PDF chart, which is in vector graphics, and will print very clearly, up on my web site, which you're welcome to download and print out. Back to the book - the main editing round (Author Review) had been done, I've caught up on sleep (mostly), and just have minor edits / corrections and suchlike to do now ... It's still rather unbelievable that I wrote a whole book (well, minus two crucial chapters by Mark!) in 13 days, tested all 351 puzzles in 4 days, and did the Author Review in 3 ... no wonder I'm a tad tired at the moment! Last but not least - Petal is discovering the great outdoors, now the weather's warming up! 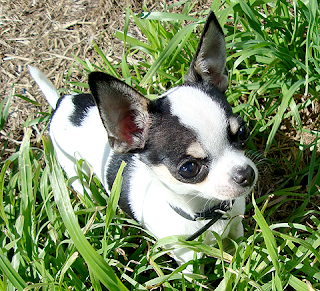 OK, I admit the grass needs a mow, but still - she's crazy cute tiny, isn't she?? Oh, how adorable is that Petal?! LOVE her! Petal looks as if she has strayed into Land of the Giants!!! She is so very cute. Hope you are catching up on your sleep!! It's a wonder you can string two sentences together! Petal would disappear in some of my grass! You totally ROCK! Now go to bed. Be careful letting that little girl outside. I've seen ants in Australia that could carry her away. Petal is cuter than ever! I was so excited to see the hat on Knitty! Wow after hearing that schedule, I need to have a lie down myself.